Betta fish, which is easy to care for, is one of the ideal options to adorn your home. Today, a large number of people choose to keep betta fish. Similar to other pets, you need to feed them. So, how often do you feed a betta fish? Perhaps, this is the most difficult thing when feeding a betta fish. For the novices, this article will share how to feed betta fish properly, along with the related problems. Continue reading to know more! See Answers to the Question: How Often Do You Feed a Betta Fish? For the time being, I and you go through each of the parts in turn. Feed a Betta Fish – How Much Do You Need? When feeding the betta fish, you ought to consider the numbers. Instead of wasting the foods while you do not keep plenty of betta fishes, you should just feed a sufficient amount of the foods. Frequently, they only take 2 minutes to eat all. Don’t need to take the finished time into consideration. Now, I will tell you to know the reason why you ought not to waste the foods while feeding your betta fish. The left-over foods settled at your aquarium bottom will make your aquarium get polluted. In this case, it forces you to have to clean your fish tank regularly in order to avoid the remaining foods that are one of the main causes of the got-ill fish. Aside from that, you still need to pay attention the betta fishes, which eat over two minutes because they likely get fat. It sounds strange, but the fish may actually become fat time to time. It is necessary to check the surrounding belly of the fish. If you recognize the bulge sign, it means that they are really overweight. For the options are the pellet-shaped foods, I recommend using 3 pellets when feeding to avoid wasting the food. How Many Times Should You Feed a Betta Fish? Saying to the betta fish’s the eating need, you should just feed twice a day. It will be to waste when you feed over this number. Generally, you are recommended to feeding it more if you look at the food packing. Simply, they want you to come back to purchase it sooner. Do you want to keep a young betta fish? Well, you still feed it twice a day. 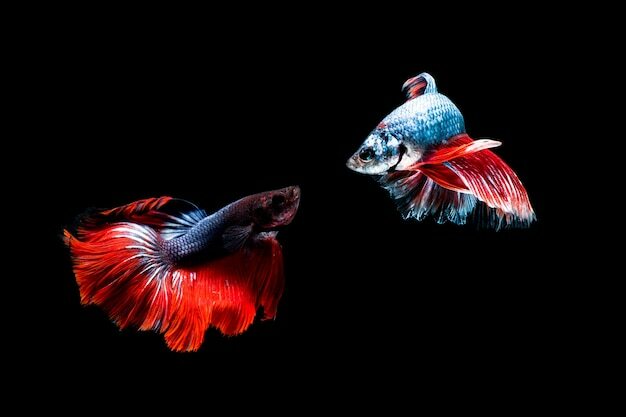 Mention to eating, both betta fish, and human are not too many differences. Their digestive system will be taken a rest if you give them a break time. It is not a bad thing. On the contrary, a break likely helps your fishes that eliminate the toxins out of their body before starting the next meal. You can even skip a meal or a day. What Should You Feed a Betta Fish? Personally, I prioritize to use bloodworms or shrimp. After freezing, you just need to unfreeze when preparing to feed. Although they seem expensive, it makes sure that your fish will get plenty of energy. In this case, I still select the bloodworms. I have a separate place to keep the bloodworms. Like that, my fish will always have the new foods to eat. Don’t forget to ensure the proper amount. I can say that this is one of the cheapest foods of betta fish. When using this food for your fish, remember to observe the reaction of your fish because not all betta fish likes this food type. If it is okay, you can continue utilizing it. Essentially, there have the specific fish pellets, which are used for betta fish, not all fish pellets. Keep this in mind! You can look for this food in the majority of the pet stores. Not only everyone, but I also use the fish flakes as the staple food because it is pretty big. That’s why it is not suitable for the small betta fish. What Should You Know When Feeding a Betta Fish? There are some points that you need to remember while feeding your betta fish. Look at here! If you have experienced in taking care of the betta fish, you will easily recognize that they directly eat the food seen before. Accordingly, it would be best to choose the float foods. The rich-in-protein foods are ideal for the betta fish as they contribute to promoting the growth. Based on my experience, my betta fish like bloodworms and flickering mosquitoes. Particular, your betta fish will eat more when they prepare to enter the spawning period. Consequently, aren’t skipped and must provide the foods for four times per day. I believe that your betta fish will grow in a healthy way if you keep what I shared in your mind. I only want to repeat one thing – feed twice a day normally and four times in the spawning period. Don’t forget! The last word, I wish that your betta fish will always be healthy.